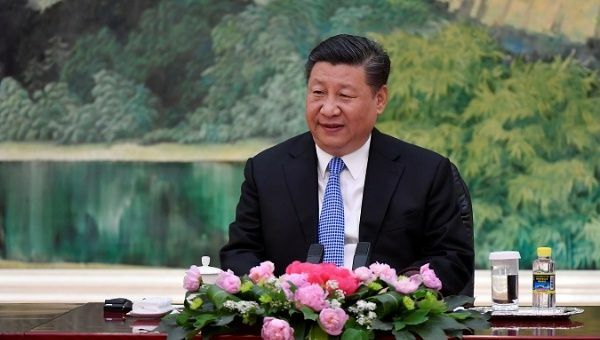 May 23 (teleSUR) The President of the People’s Republic of China Xi Jinping congratulated Nicolas Maduro for his reelection as the President of the Bolivarian Republic of Venezuela, in the name of the Chinese government, its people and himself. “I’m willing to work with you to strengthen the exchange between both countries, reinforcing the practical cooperation, and taking the China-Venezuela Strategic Integral Alliance to a superior level, for the greater benefit of both countries and peoples,” reads the letter. The Chinese president also wished good health and performance to President Maduro, and hoped for stability and development for Venezuelans. The Chinese Foreign Ministry spokesman Lu Kang had previously called for respecting Venezuela’s electoral process, saying that “the parties involved must respect the decision of the Venezuelan people,” and encouraged all parties to resolve any dispute through legal channels. Other heads of state have recently come forward to congratulate Venezuela’s President Nicolas Maduro on his successful reelection on May 20, including Turkish President Recep Tayyip Erdogan and Russian President Vladimir Putin while the European Union and Organization of American States (OAS) have refused to recognize the results. Also, the Russian Foreign Ministry spokeswoman Maria Zajarova said that the electoral process reflect the will of the Venezuelan people. “We take the fact that there’s been elections as a starting point, and that is the will of Venezuelans that attended the polling stations and expressed their compliance with that democratic procedure. That will, expressed through law, must be respected,” said Zajarova. “With the supposed purpose of punishing certain politicians, the package of measures adopted aims at blocking channels and external financing sources, actually worsening the situation,” she said. On Tuesday, the United States imposed new sanctions that complicate the financial situation of the oil country, which further continued the policy of intervention and interference by Washington and its regional allies who seek to oust the leftist government.